June Stevenson is a Nordic Walking coach and practises what she preaches, as she “nordic walked” her way to our meeting this morning. June has had an active life, participating competitively in netball and basketball, as well as doing triathalons, cycling and running. Once she tried this activity she was hooked on its benefits. Originating from the cross-country ski-ing industry she described it as an intensification of how we should walk. 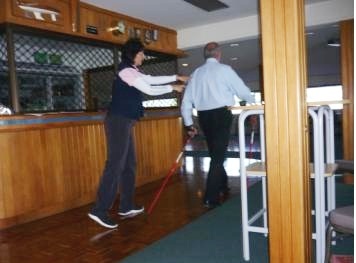 The poles are specific to Nordic Walking, made of a carbon fibre composite material and can be used on all surfaces. The action and technique takes pressure off the knees and uses more upper body. When walking, 60% of the time we are on one foot or the other, we usually have a passive upper body or poor posture and often lean forward. Walking naturally requires some torso rotation and arm swing and when using correctly sized poles there is better posture and gravity position. The shoulder girdle is the prime mover and the arm and the pole is the lever to move the body through its motions. Nordic walking also helps with engaging the major organs are in the upper body and improving their blood supply. As the torso begins the move it pumps better blood supply to the shoulder area – which is a particular problem area as we age. It releases tension through the shoulder and neck, particularly useful as we currently sit longer than we should with computer-oriented work. It has great benefit for people with mobility and health issues and helps diabetics with compression through feet. June coaches groups of people around Auckland, often in many of Auckland’s wonderful parks. She has a group who call themselves “Nordic Nanas”, whom are off to do a walk in Queensland. 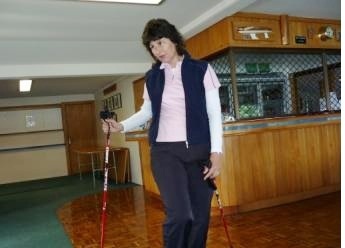 Nordic walkers regularly do the Rotorua marathon and other half marathons. She stressed it is important to learn Nordic Walking from a qualified instructor, as the poles need to be the correct height for the person and it is not used like a tramping pole. David was a guinea pig and it was interesting to see the difference in his walking style under a snippet of June’s instruction. David himself said he noticed he was working his upper body more.